The casket of Michael Brown sits inside Friendly Temple Missionary Baptist Church awaiting the start of his funeral Aug. 25, 2014, in St. Louis. 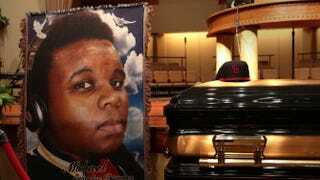 Brown, an 18-year-old unarmed teenager, was shot and killed by Police Officer Darren Wilson in the nearby town of Ferguson, Mo., on Aug. 9, 2014. Traditionally in black American communities, when someone dies, before the spirit-filled homegoing service and solemn funeral procession to the final resting place, there are those quiet moments in the embalming room between the deceased and the mortician, the dead and the artist. If death was by stroke and the face of the deceased is disfigured, the artist will mold the features so that one side does not sag. If there has been discoloration, then makeup is carefully applied to match the deceased’s skin tone as closely as possible. If the death was quick and violent, then the grimace of pain that tends to stay long after the deceased has taken his or her last breath is smoothed into a neutral expression and, if possible, a peaceful smile. My family has owned a funeral business for over 60 years, and from the time I was a small child, I was taught about the sacredness of dead, black bodies and how we care for them. We make a promise to the souls of black folks who once dwelled there: We will honor and protect your body, your humanity, because you no longer can. It is through this lens that I watched images of Michael Brown’s body splashed across both traditional and social media after then-Ferguson, Mo., Police Officer Darren Wilson gunned him down in a hail of bullets. Brown’s state-sanctioned killing quickly became a salacious headline for some mainstream outlets, and his post-mortem dignity was easily traded for page views. Though there are other features at the exhibit—a Confederate flag, shackles from a slave, a black Statue of Liberty, a noose hanging from a neon sign, an “I Can’t Breathe” sign—Brown’s likeness is, by far, the most controversial offering. Moore portrays Brown just as Darren Wilson left him: facedown on the scorching-hot pavement, a replica of his red Cardinals fitted cap on the ground in front of him, his white T-shirt stopping just at his waist, and his khaki pants slightly sagging over dark-colored boxers. He is surrounded by police tape. And I instinctively drew parallels between the artistry of those who honor dead, black bodies and the artistry of those who would exploit them. “We know this is a courageous exhibit for us, also for Gallery Guichard in the heart of Bronzeville, to deal with race in such a way that it makes people stop, and we’re really excited about that,” says gallery owner Andre Guichard. I grappled with this most of the weekend. I watched news reports over and over again. I exchanged emails with colleagues, and we worked through a few of our thoughts together. I put Nina Simone’s “Strange Fruit” on repeat and let the tears fall as I held my brown boys close to my heart. A day that began with me reading about a 13-month-old baby boy being killed in Chicago had suddenly brought me right back to the South Side to see another mother’s baby stretched out on the ground, death clinging to him. And I struggled mightily with that too-much-ness, allowing myself to get lost in my own cognitive dissonance. I have never believed in censorship, and as video after video of slain black people continue to populate my newsfeed, I have continued to voice my belief that we cannot hide from the viciousness of this white supremacist country; we cannot soften the blow of what has been done to us. We must stand in the tradition of Mamie Till and force this nation to reckon with its own grotesque nature, to look at the twisted mouths of our children and see what it’s capable of justifying and forgiving. See what it’s capable of forgetting. I tend to reject safe art and embrace what makes me step out of my comfort zone and feel something, so I have fought against my reaction to Moore’s piece. Some may read that as meaning that she has accomplished her mission, but they would be wrong. My reaction is to her having her white hands on Michael Brown’s black body when he’s not here to protect himself. It is eerily and unsurprisingly reminiscent of poet Kenneth Goldsmith’s having the audacity to read Brown’s autopsy report and call it poetry. Here’s the thing, though: Michael Brown’s story has been and will continue to be told. His death radicalized a new generation of activists who have shaped global conversations about institutionalized racism and police brutality—and the revolution is still unfolding. Though Morgan may not see it, and the white gaze grasps at distorted shadows of it through blurry vision, that has been Brown’s story since he was slain almost one year ago. Moore’s “art” is not original; it is a crude plagiarism of Darren Wilson’s brutality, nothing more. Memories of Brown’s desecrated body are already emblazoned across every home and every hood and every heart of every black person who has ever realized that this country never loved us at all. We do not need a “courageous” white artist to sign her signature on the body of our dead to understand that.